The biological functions debate is a perennial topic in the philosophy of science. 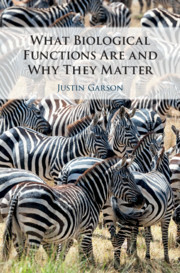 In the first full-length account of the nature and importance of biological functions for many years, Justin Garson presents an innovative new theory, the 'generalized selected effects theory of function', which seamlessly integrates evolutionary and developmental perspectives on biological functions. He develops the implications of the theory for contemporary debates in the philosophy of mind, the philosophy of medicine and psychiatry, the philosophy of biology, and biology itself, addressing issues ranging from the nature of mental representation to our understanding of the function of the human genome. Clear, jargon-free, and engagingly written, with accessible examples and explanatory diagrams to illustrate the discussion, his book will be highly valuable for readers across philosophical and scientific disciplines. Introduction; Part I. Background: 1. The strangeness of functions; 2. Function and selection; 3. Feedback and functions; Part II. Theory: 4. An explosion of selection processes; 5. Selection and construction; 6. A generalized selected effects theory of function; 7. Proper functions are proximal functions; 8. When functions do wrong; Part III. Applications: 9. Function pluralism; 10. What are mechanisms? ; 11. What are mental disorders? ; 12. A new kind of teleosemantics; A programmatic epilogue. Justin Garson is Associate Professor of Philosophy at Hunter College, City University of New York. He is the author of The Biological Mind: A Philosophical Introduction (2014) and A Critical Overview of Biological Functions (2016).